Here is one of mine that I miss dearly. BT EG 5 string and my latest addition that's currently being repaired by Ken Smith a CR6 6 string all different woods from Tiger Maple to Walnut. They are all great basses and serve me well. I currently play for The MT. Carmel Baptist Church Sanctuary Choir, The Associated Praise Team and a youth group by the name of Unified Souls. Are you sure that's a BSR5EG? It looks like a BT5EG to me..
Well, I think that is something we can do. You also must understand how we slot the fingerboards which is the same for fretted or lined fretless. The accuracy must be 100% with no guess work in the spacing. This is our slotting machine here that we made years ago. I guess we could modify the Jig to cut only the sides like your photo suggests. A lot of people seem to like those side markers. I personally like the lined look though. Should have used my own bass to demonstrate! The fretless I play right now is lined. I like the look of a big-fat spotless ebony board. These only have side dots, 3mm pearl. The craftmanship that went into creating that piece of art is simply breath taking. The wood on that axe is so stunning it almost looks as though its in 3-D.
You must learn to ignore the lines! YES!!! Now the question is, what's the darkest wood available for the wings. Ebony? Would that sound like dog meat? The wood used would depend on the model as far as we are concerned. Our Ebony has some stripes but not always visible. This is a Top Wood and not a solid wing material. Ebony is best finished in Lacquer as the Oil does not look as good being that Ebony is an oily wood in itself. Walnut is another choice and the shade of darkness varies but never as dark as Ebony. Some of our Imbuia is dark as well as Cocobolo. With Cocobolo, we get into the Finish process again. Woods like Ebony and Cocobolo are standard on the Elite models but available up-charged on lower cost models with the Oil/Varnish finish. By the way what kind of sound does dog meat have? Never made a bass with it so I am asking.. Sounds like ebony top wood in lacquer is the ticket. In the BSR5EG models, is an ebony veneer on the headstock an option? Most Basses especially the Elites have a matching headcap, bookmatched. In Ebony, you can;t see the match so well but it's there. At the moment I have just one Smith, a BMT Elite G from 1994. It is, hands down, the best bass I have ever owned (and I've owned a lot). 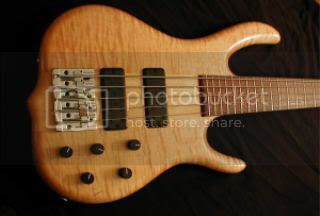 I bought it a few years back, and it was originally fretless and had seen some wear. The guy I bought it from said it had been owned by Reba McIntire's bassist, but I can't confirm if that is true or not. Anyway, I returned it to Ken to be refinished and have the sp switches fitted. It was given a general overhaul and a few other bits tidied up. Now it plays like a dream and has the most amazing tone. The fingerboard is one thick slab of ebony that gives the bass massive sustain and presence in the mix. I love it! Doc, that is a beat. I want to post pictures of mine, but i still dont know how to put a picture on here.